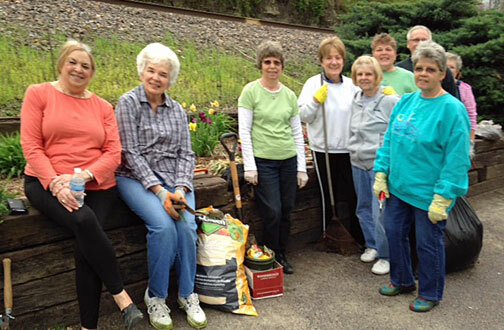 On April 14 members gathered for the spring clean-up of the downtown garden. Last year, our lead coordinator Carol Bell, initiated the “Adopt a Plot” maintenance plan for the area. This has proven to be very successfully. Not only has it resulted in more consistent upkeep, it has also introduced a diversity and creativity not evidenced before. Plants donated by members are adding variety and thanks to Astral Glass visitors will find their creations tucked between plants. It is the goal of the garden club to have blooms from spring through late fall. If you are in the downtown area, I urge to get out of your car and walk along the garden to enjoy it at its fullest. Anyone interested in adopting the several plots which remain “orphans” may contact Carol Bell (237-2832). On Tuesday, April 28, garden club members will tour Heidi Groner’s hydroponic gardens outside of New Haven. Anyone wanting more information about this tour can contact Jane Scheer, (237-3527) coordinator. On May 16 a field trip is planned to Ste Genevieve for its Garden Walk 2015, Rosalie Laune (237-2564) coordinator. On May 16, the Franklin County Masters Gardeners are sponsoring a plant sale and boutique from 9:00 A.M. to 3:00 P.M. in front of the J C Penny store in Washington. During the sale, Master Gardeners will be available to answer your gardening questions.